Canvas Health is dedicated to offering hope and help to children, adolescents, adults, the elderly and families who struggle with aging, transportation, chemical and mental health, and abuse. Established in 1969, Canvas Health has grown to become one of the most distinctive private nonprofit human service centers in Minnesota. 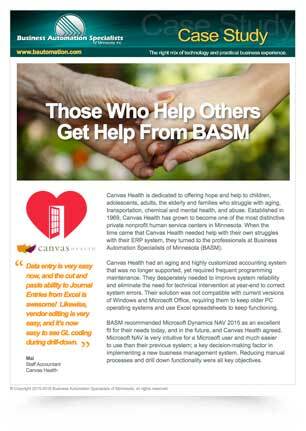 When the time came that Canvas Health needed help with their own struggles with their ERP system, they turned to the professionals at Business Automation Specialists of Minnesota (BASM). Canvas Health had an aging and highly customized accounting system that was no longer supported, yet required frequent programming maintenance. They desperately needed to improve system reliability and eliminate the need for technical intervention at year-end to correct system errors. Their solution was not compatible with current versions of Windows and Microsoft Office, requiring them to keep older PC operating systems and use Excel spreadsheets to keep functioning. BASM recommended Microsoft Dynamics NAV 2015 as an excellent fit for their needs today, and in the future, and Canvas Health agreed. Microsoft NAV is very intuitive for a Microsoft user and much easier to use than their previous system; a key decision-making factor in implementing a new business management system. Reducing manual processes and drill down functionality were all key objectives. BASM successfully completed the implementation, and was able to do so 13% under budget. The project scope was also expanded to include Jet Reporting and ABRA Payroll import. In addition to achieving Canvas Health’s initial goals, there were many other benefits to implementing NAV 2015. NAV allowed for a drastic reduction in the number of accounts in their COA through the use of Dimensions, while expanding their ability to track additional data. This simplified data entry as well as improved export functionality to Excel, streamlining the time and effort required each month to produce profit center financial statements via Jet Reports. Other benefits resulted from cross accounting periods, ease of journal entries, and improved balance sheets.